Packers wide receiver Randall Cobb is still currently on injured reserve, more than 10 weeks since he fractured his right tibia on Oct. 13. 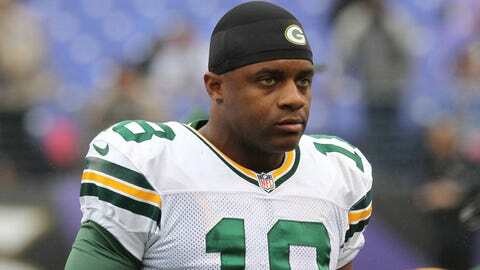 GREEN BAY, Wis. — Fresh off of getting the long-awaited good news about Aaron Rodgers, the Green Bay Packers are moving closer to the possibility of teaming up their starting quarterback with his top receiver, Randall Cobb. Cobb is still on injured reserve, now more than 10 weeks since he fractured his right tibia. But in his second week of practice, Cobb has shown coach Mike McCarthy that a return could potentially be imminent. "I thought Randall had a very good day today," McCarthy said Thursday. "He was very positive at the end of practice. I feel a lot better now than probably I did this morning. He definitely took a step in that direction." Cobb just began running again two weeks ago, but he said it’s "definitely encouraging" that he’s progressed to the point that he’s at now. "Today was the first day that I actually did some cutting and didn’t think about it," Cobb said. "That’s definitely progress and that’s definitely confidence to me, for me, in my knee. I think that’s very important for the next step." Cobb was the Packers’ leading receiver this season before Baltimore Ravens safety Matt Elam tackled him around the knees and caused the injury on Oct. 13. For a receiver who relies a lot on his speed, Cobb may not be effective if he struggles to run and cut. However, Cobb insisted that he has confidence in himself, even if his body is not near 100 percent health yet. "The last couple times that I ran this week, I’ve had confidence in my knee, in cutting and not thinking about it, and just going out there and letting loose instead of focusing in on cutting off this leg," Cobb said. Wide receivers coach Edgar Bennett has kept a close eye on the way that Cobb is running routes during practice. "Any time you miss a significant amount of time, you do have to go back to your fundamentals, and that’s something he’s been doing the last few weeks as far as getting his timing down, his footwork down, in and out of his breaks," Bennett said. "That takes a little time, but certainly not to be too vague about it, but he has improved in that area. His tempo, his speed, all of that helps in practice. And also being competitive in practice situations, all of that helps. "We try to simulate game speed as close as possible with our tempo, and it certainly helps him get back into a rhythm and a routine of playing on a high level." Bennett added that Cobb appears to be "getting there" at this stage in his extended recovery. With Green Bay’s opportunity to win the NFC North on Sunday with a road win over the Chicago Bears, Cobb has his sights set on being a part of that game. "This week in practice I’m going out and preparing to play," Cobb said. "But that’s not my call to make. My position is to communicate with the coaches and with the training staff how I feel and just let them know that and let them make that decision." In order to play in a game, Cobb will have to be added to the active roster, a move that has yet to happen. However, the Packers have two of their 53 roster spots open after recently placing defensive lineman Johnny Jolly and tight end Brandon Bostick on injured reserve, so it won’t be a challenge for Green Bay’s front office to get Cobb on board. Cobb was eligible to return from his injured-reserve designation before Week 15, but he wasn’t ready at that time. "It’s great to obviously have him back out there and running routes with the ones (the starters) and feeling it out," fellow receiver Jordy Nelson said. "We need to go get this win. I don’t know what they’re scheduling for him, but it’s a good time to get everyone back and see what happens."